A lovely slice of Yum-yum dessert to finish off our pick-nick. This dessert is a classic in my family. Once you make Yum-yum dessert, it’s sure to become a favorite for you and your family too! My husband and his family grew up with this dessert. It’s practically a tradition to end Sunday dinner with this tasty treat. It’s a bit of a 70’s throwback, with toasted coconut sprinkled on top and pistachio or chocolate pudding as part of the filling. A foundation of homemade shortbread with chopped nuts is topped with layers of sweetened cream cheese, pudding, whipped topping and toasted coconut. It’s a mix of flavors that are sweet, buttery and delightful. Here you can see all the layers of flavor in Yum-yum dessert. At first I struggled with getting the bottom layer of shortbread-like crust to bake correctly in the oven. It’s a bit difficult to judge when it’s done baking. 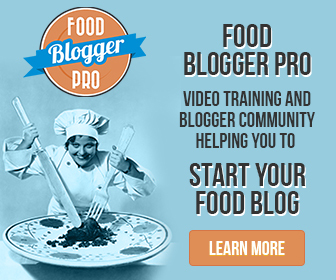 I made the recipe several times to make sure it would come out just right for you. There are definitely some no-no’s when making Yum-yum: Don’t melt the butter, just use softened instead. Also the baking time changes quite a bit depending on which type of pan you use. A metal baking pan will shorten your baking time by almost 10 minutes in some ovens. The crust should be firm to the touch and just barely golden brown when done. Make sure you let it cool completely before continuing on to the other layers. Once you have the shortbread crust baked, making the rest of the dessert is fast and easy. Just make a layer, spread it on, and pop it in the fridge while you make the next layer. When you serve it to your friends and family, make sure to save a piece for yourself; or you may not get one! It goes fast :0) I hope you enjoy making and eating Yum-yum dessert as much as my family does. Equipment needed: A 13 by 9 inch casserole dish. A food processor is very handy for making the crust, and a hand-held mixer for whipping up the middle layers. Either one is not essential though , a fork and a whisk work too, it just takes a little longer. 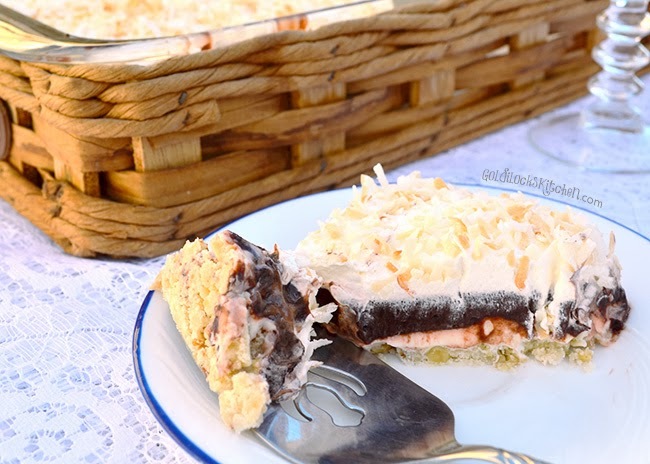 A delicious layer dessert, with chocolate pudding, whip cream, toasted coconut, and anchored with a light cookie crust. Great for a summer pic-nick or Sunday dessert. 1/2 cup of shredded coconut, toasted in the oven for about 5-7 minutes, or until portions turn golden brown. Set oven to 350 degrees. Combine flour, nuts and butter in a food processor. Process until one or two solid clumps of dough form, about 10 seconds. Press into the bottom of a 9 by 13 inch baking dish using a spoon or by hand. Bake for 20 minutes if using a metal baking pan, or 25 to 30 minutes if using a glass dish. Remove when the crust has just begun to golden and is firm to the touch. Let cool 20 minutes before proceeding with the other layers. In a mixing bowl, mix softened cream cheese and powdered sugar, then add one cup of whipped topping. Mix until smooth. Spread over crust in pan, and place in the refrigerator. In a mixing bowl, add both pudding packets and milk together. Mix until smooth and thick, about three minutes. Pour and spread out over the cream cheese mixture. Place in the refrigerator. Set your oven to 350. on a baking sheet, spread out the coconut. Toast in the oven until portions are golden brown, about 5 minutes. It toasts fast, so watch carefully not to burn it. While the coconut is toasting, spread the rest of the whip topping over the pudding. When the coconut is done toasting and cooled a bit, sprinkle it over the top. Serve. Yeap that is terrific stuff alright.